First of all, I lost my fiddler-ring and I don’t want to talk about it. I had been wearing it on my little finger because it was tight on my ring finger, and sometime on Thursday it slipped off unnoticed. On Thursday I visited Arabella, a women’s clothing boutique that just re-opened in Winchester. They are now stocked with fall clothing and jewelry, so go take a look if you’re in Creekside. I was making jewelry up until I left for my appointment, so I don’t even have pictures to show you what they have. I did update my necklaces and bracelets pages with some newbies, though.Friday night I met a couple friends at Gourmet on the Go, which is the local meal assembly place. The idea is to put together freezable meals while hanging out with your friends, and it was fun. I’ve been to My Girlfriend’s Kitchen before and it’s the same thing. I’m really looking forward to trying the Raspberry Chipotle Pork Tenderloin. Saturday Steve and I tackled the studio swap, and it is lovely to be writing to you from this bright room across the hall from Steve’s office (read: no more yelling when the phone rings). Look at all the space! In the middle of the room! You have no idea. On the left is what used to be our wardrobe (historic home in Delaware=no closets) which I retrofitted with shelves for storage. 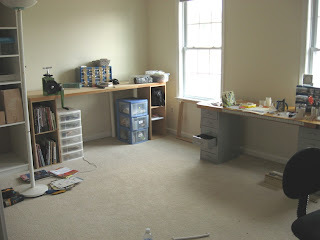 Next to it is my metals bench (the torch is in the garage) and in front of the windows is my beading station. The black chair is sitting in front of my desk over to the right, where I can update my website and answer email for hours at a time without the need of a jacket (as I did in the basement). I’m going to use the basement room for non-jewelry crafts, like sewing slipcovers for the rattan furniture and making Christmas reindeer cards from Riley’s hair. Just kidding about the cards. Reminds me of that circulating email about Martha Stewart’s calendar (French braid lawn, install plumbing in gingerbread house). We had friends over for dinner last night, and are taking it easy today. 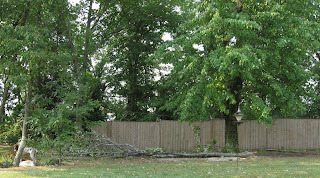 The main event (other than lunch at Outback) was a tremendous thunderstorm that caused this tree damage. I guess we’ll be borrowing Dad’s chain saw and having lots of fire-pit parties. My little yellow maple is now bald (in JULY! ), but fortunately the wind took away all the leaves. Notice Riley standing in Command Post 2.